A bogus war hero who was exposed when he wore an "impossible" array of medals at a Remembrance Day parade has been sentenced to 60 hours' community service. A court was told that 62-year-old Roger Day started lying about his military career to impress a younger woman he later married. Day told his wife, Maxine, that his original medals had been stolen and she set about putting together a replacement set, buying them from veterans and from the internet. 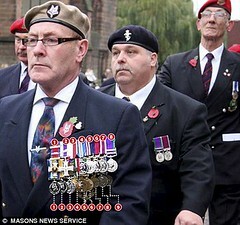 It was when Day wore the medals, which spanned the period from the Second World War to the Gulf War, at the parade in Bedworth, Warwickshire, that his deceit was unmasked. Magistrates in Nuneaton heard that Day had met his bride-to-be at a local opera club and was desperate to impress her. She became his third wife in 2005, five years after they met. Day, a father of three, admitted deception at Nuneaton Magistrates Court. The court heard that his only genuine military experience had been as a teenager in 1963 when attended an 18-month Junior Leaders course. Mr Day married his wife, who is 24 years younger than him, five years ago. In order to maintain interest in him he made up stories about having served in the British Military and various accounts of bravery he was involved with. "Out of kindness his wife began to purchase the medals from collectors as various replacements for him. He started wearing the medals over the years and began bragging and told stories to others while wearing the medals.